Today I’ve got something very special to share and I hope you think so too. Not too long ago my friend Anita, from Cedar Hill Farmhouse, asked me if I was interested in a monthly DIY Tips and Tricks event that she was putting together. Well…I didn’t hesitate one second before saying “yes!” You see…Anita and her family have a real, honest-to-goodness farmhouse…as do the other two bloggers, KariAnne from Thistlewood Farms and Yvonne from StoneGable. I am so happy to be able to share not only my tips and tricks…but theirs too, along with their amazing homes. 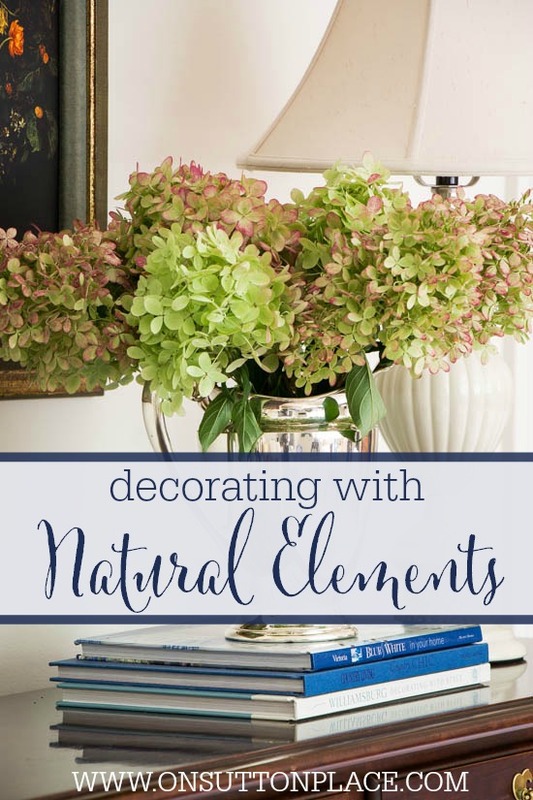 Coming up with my “best” DIY decorating tip wasn’t hard at all because it’s the one you’ve heard me chant many times…add at least one natural element to every room. More if you feel inspired. 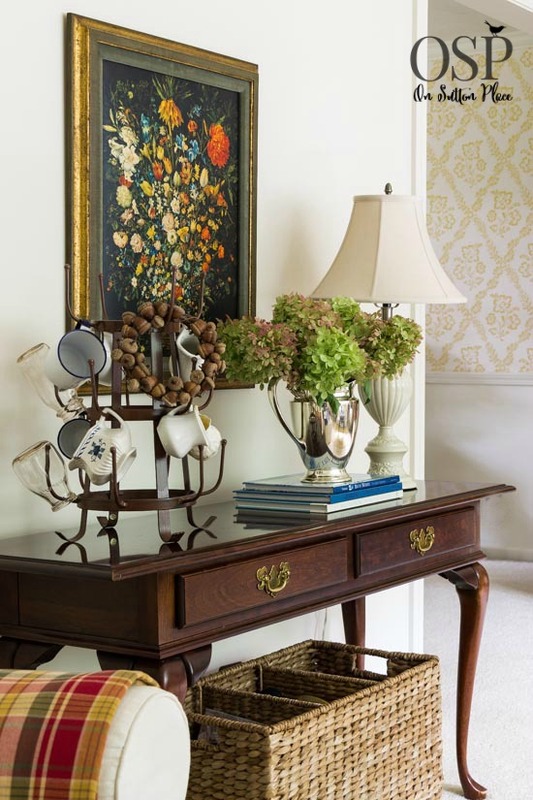 Natural elements add warmth and life to any room. They say welcome. They say cozy. They immediately send out the message that you love and care about your home. Natural elements come in many different sizes and shapes. They can be fresh or dried flowers, greenery or produce. It doesn’t matter one bit where they come from. Use what you have and don’t make it hard. One of my favorite things to do is cut greenery from plants in my landscaping. I also sometimes cut tree branches and bring them inside. The different seasons offer different options. Right now, mums are absolutely everywhere…as are gourds. Look no further than the produce department of your grocery store for inspiration. 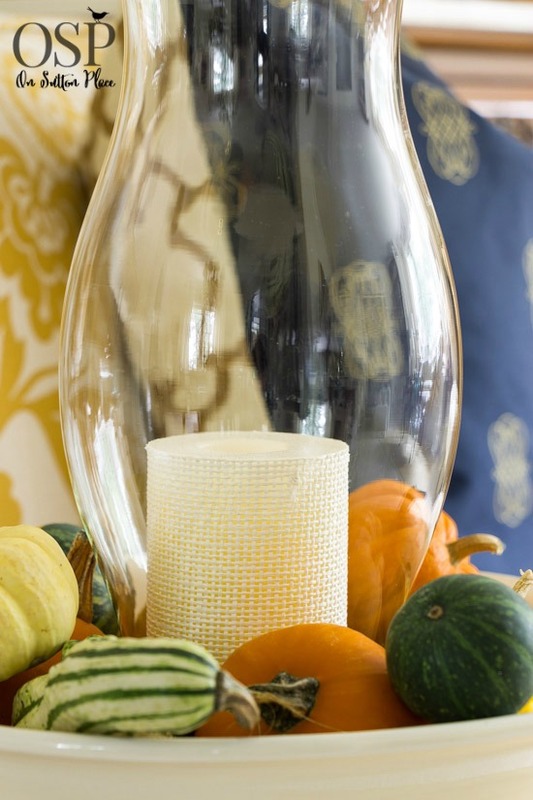 Pumpkins and squash have amazing color and texture. When Christmas rolls around there will be red or green apples, pomegranates and everyone’s favorite, cranberries. Lemons and limes are great in the spring and summer. Don’t be afraid to think outside the box. Not too long ago my neighbor gave me some false indigo seed pods. I think they are the so cool. I paired them with some dried wheat in my vintage mason jars. The wheat is left over from the wheat wreath I made for my front door. So…the false indigo was a freebie, the wheat was a left over and I already had the jars. Basically a free vignette for my coffee table. One of my favorite things in the whole world are dried flowers. I have loved them forever. Lavender is, of course, what I think of first when someone says “dried flowers.” But don’t forget other flowers from your garden. I have three puny, first year limelight hydrangeas. They produced the most amazing blooms and they were so plentiful that I couldn’t even cut them all. Some of them dried right on the bush. I cut them a few days ago and brought them in. I have no idea how long they will last…but for now I am in love. 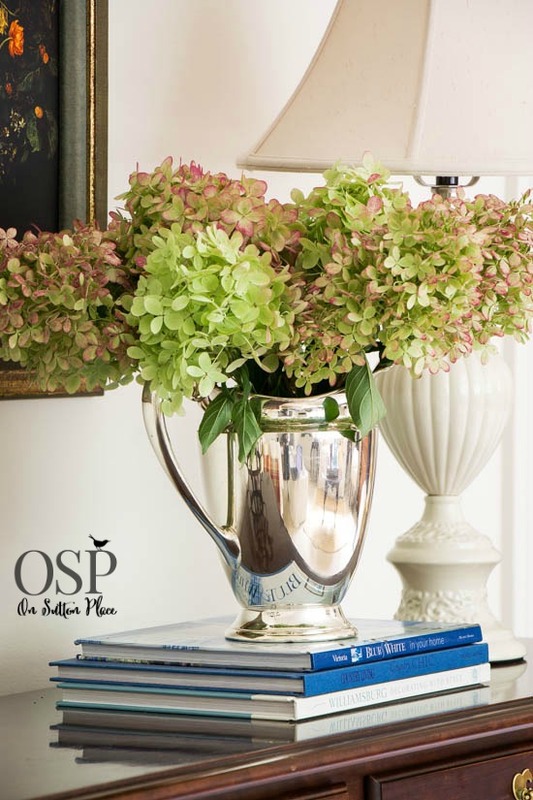 I hope you’ve been inspired to bring a little life to your rooms with natural elements. Thank you for stopping by…see you in a few days! Thank you for this post! Just love it… very inspiring. I only wish I had saved some hydrangeas to dry before they stopping blooming. 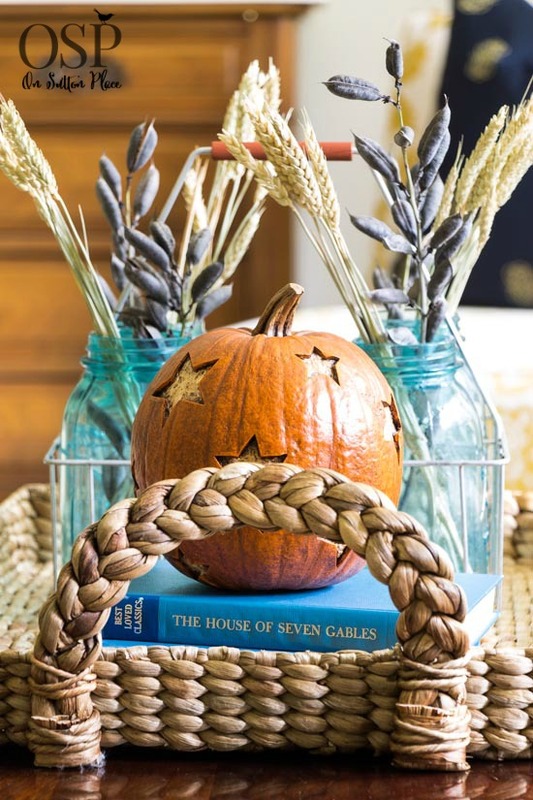 :( I linked to you from http://www.mommade.org/2014/10/decorating-with-natural-elements.html. Have a great day! Your natural elements are beautiful. For the first time, my false indigo produced the seed pods. I was stunned to discover them and immediately brought them inside. I’m enjoying them so – hopefully, they’ll continue to dry without getting too crumbly. I enjoyed your post very much, as always. Blessings! LOVE your natural elements and styling. So pretty! My whole mission is to make the most with what I have and you did that and then some. It looks so fantastic!!!! I love it. I just love blue with all of the Autumn colors. Beautiful! it’s a elegant, exquisite and inviting website, that I’m still browsing. can.t wait to get back to it. So bye for now. Perfect timing with this post, dear friend!!! to use in an upcoming Tablescape post just this week!!! Thank you for more images of your lovely home!!! 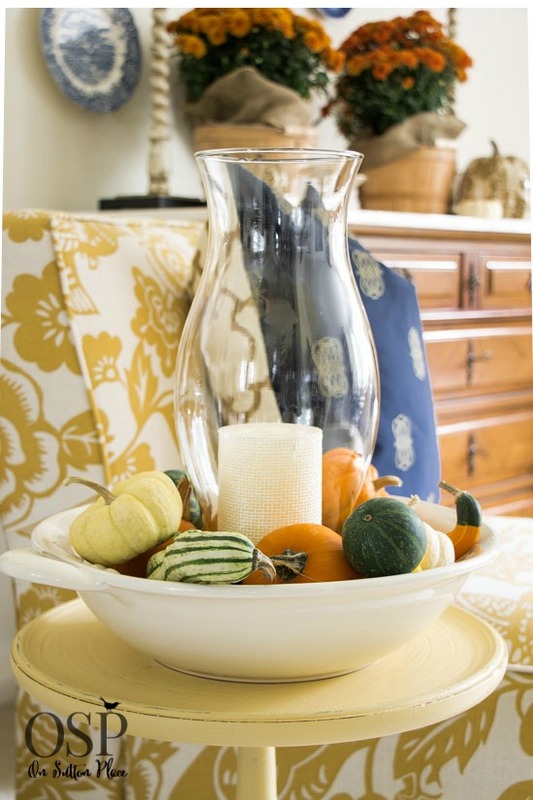 Everything is beautiful at your house as usual and I love looking at others styles and touches of seasonal decorating. I also use many natural elements in my decorating. 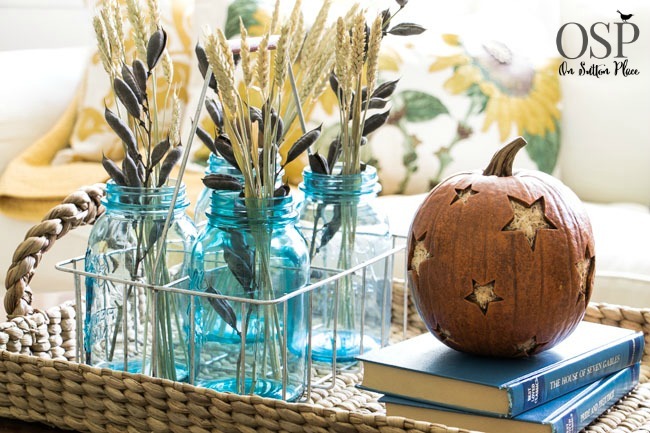 It’s easy, inexpensive and certainly adds a personal touch to any space. Thank you Jeanette! You are right…a personal touch is the best thing ever! I couldn’t agree more Ann! I love natural elements everywhere. Your home is so beautiful and I love your French chest of drawers. I am needing some help on my blogspot. Having trouble posting my pics from my iPad etc. when you choose the source it won’t download. Any ideas to help? I haven’t used Blogger for a few years so I’m not sure how to help you. I’m pretty sure that you can’t upload pics to Blogger from an iPad but that may have changed recently. I’m sorry…good luck! You have the perfect Trifecta of bloggers to begin this feature with. I’m a long time follower of all of you!! Thank you. And these are fantastic ideas, I agree with you 100% about having some natural displays, mostly organic, in every room. Fall seems to be the perfect time of year for that! I have the same limelight hydrangeas, my first year as well. I let them dry a bit on the bush, if they are really fresh, they will just wilt when you cut them. And…I’m wondering, maybe I missed the post. Did you make the star cutouts on the pumpkin? If so, do you have a link or instructions? So cute!! No that pumpkin is actually made from wood! I’ve had it for a few years and every fall when I get it out I am so glad I bought it. Wonderful tips! Love your Blog! I LOVE your house! Love your style! Are those baskets with the blue plates around them a new addition? Very interesting mix of rough and refined. At my house “Fall has fallen” even if it was 91degrees yesterday but with two young grandsons, I pulled out all the stops on the first day of Fall and now have pumpkins and gourds everywhere. Goblins and witches don’t come out until after my birthday tomorrow. Happy Birthday! 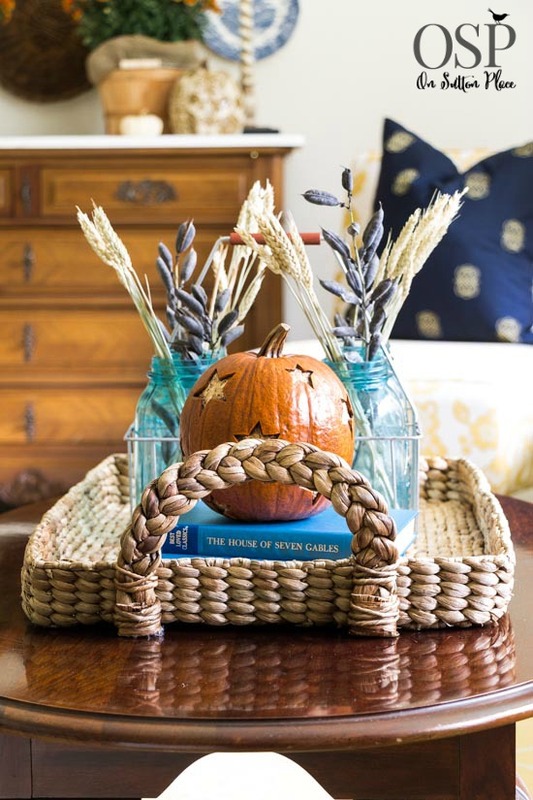 Yes I got the trio of baskets earlier in the summer from Decor Steals. I think they work too…thanks so much! What a lovely room, full of rich colors and testures. The natural elements are best! Did you make your mini acorn wreath hanging on your glass rack? I LOVE IT. Hi Melissa! Yes I made the little wreath last year. Here’s the post where I shared my process…it is really easy! Love this so much! 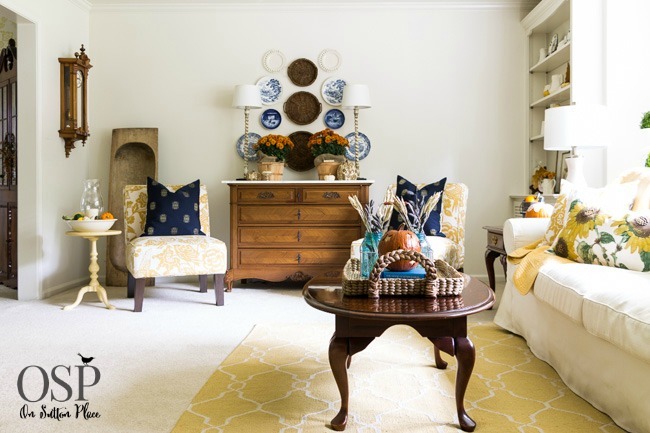 You have incredible style and bringing the outside in really makes your rooms shine! No I’ve had the bottle rack for a while but honestly have never found the perfect spot. It moves around a lot! Thanks for stopping by…hope you have a fun weekend planned! And you my friend are a fantastic decorator. Great tips Ann! I love all these tips. I am a huge believer that you can have a pretty space and beautiful pieces all around you without breaking the bank. A little creativity and thinking outside of the box can take you a long way. Your home is beautiful as always! I completely agree Lindsay…thank you so much! Hi Belinda! I’ve had the sofa a few years. Here is a post with all the information. I wrote it when I got the slipcover. Thanks for stopping by! Hi Ann! 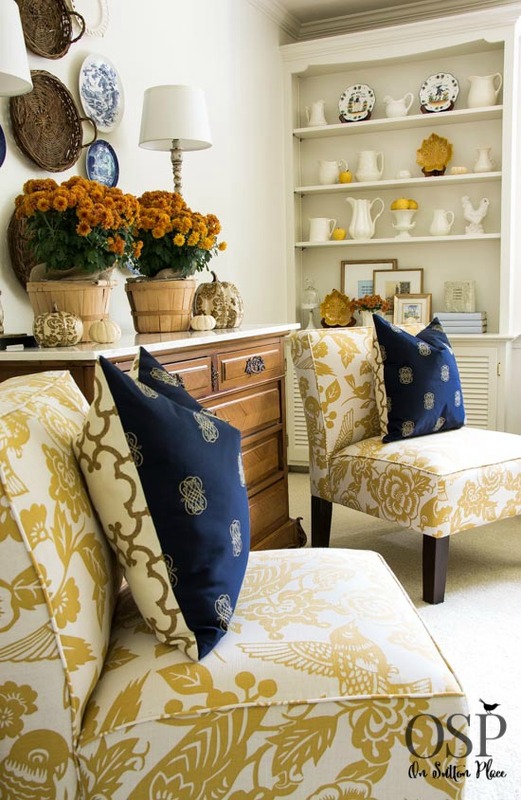 Great tips and your home just looks beautiful – always. You have a natural sense of style and I love it. Hope you’re doing well. Beautiful, Ann. 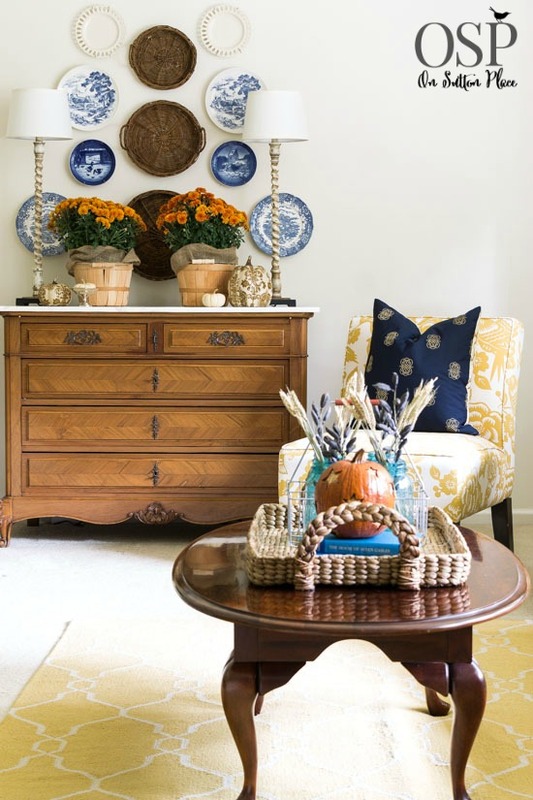 I love the wicker on the wall with the plates and that whole vignette. Oh, my Ann! This is a wonderful tip! 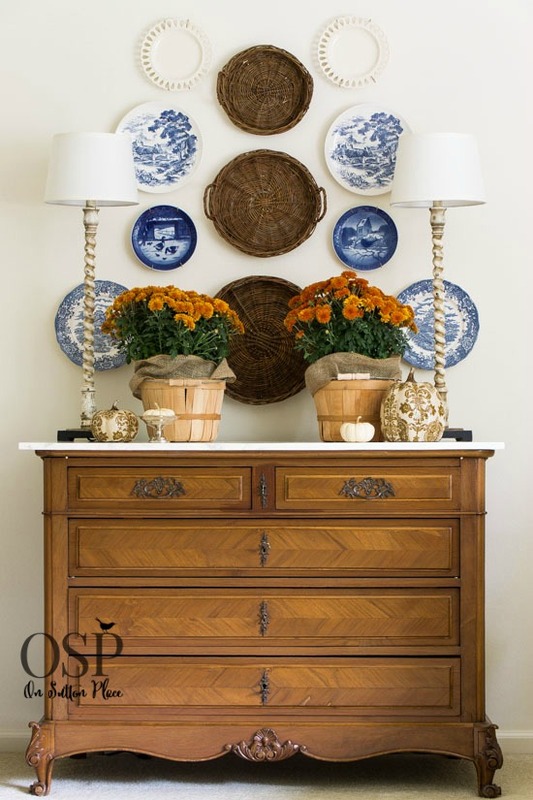 LOVE your dressers with the blue and white plates and the baskets together! Those are a great way to display naturals too. I would write lots more but my big dog is such a pest this morning! LOVE partying with you! Wow! Tips from my very favorite bloggers: Ann, KariAnne, and Yvonne. Your hydrangeas look beautiful. I have my hydrangeas in ball jars drying out using the water method. They look like yours and I am so anxious to display them for the holidays. Your sunflower pillow caught my eye also. Your home is lovely with all the natural elements. I love all the natural elements. It is absolutely beautiful. 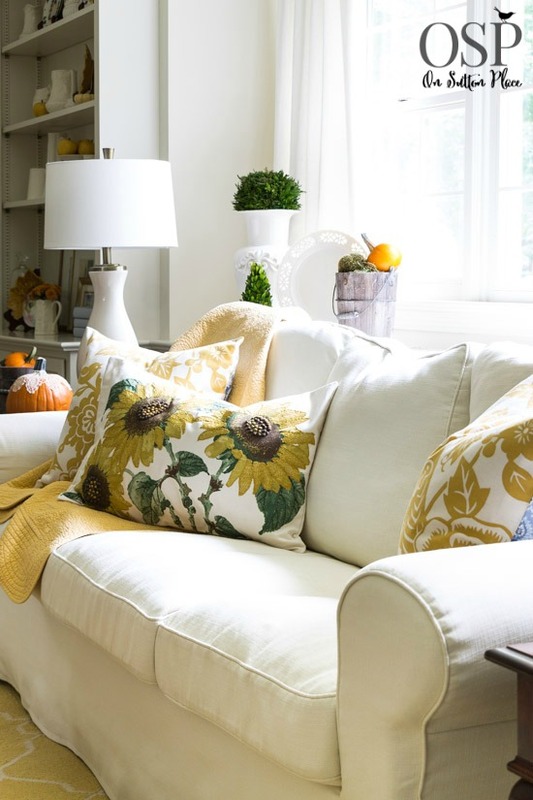 I would love to know where you purchased the sunflower pillow on your couch…love the texture!